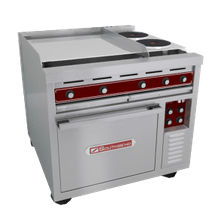 Commercial Stoves | Commercial Ranges | Singer Equipment Co.
An essential in any foodservice operation, commercial ranges are multi-purpose pieces of equipment. Ranges allow for a wide variety of cooking techniques such as boiling, sautéing, roasting and searing. Depending on the usage of the range will determine if a light- to medium-duty restaurant range or a heavy-duty to accommodate high volume use and heavier pots and pans. Gas ranges are the most popular choice when it comes to rages because of their instant heat and precise temperature control. Electric models are also available and are a perfect solution for operations without a gas hook up. Gas ranges feature open burners and varying BTU outputs, depending on the demand required. 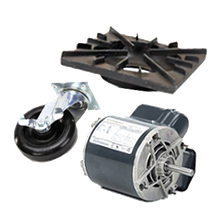 Electric models are available in a variety of voltages. Configure your commercial range to fit your specific needs or cooking style. 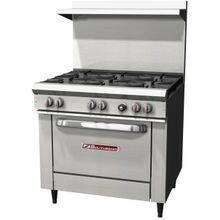 Choose from open burner, griddle, hot top, charbroiler, work top and french top configurations. Bases can be customized with standard ovens, convection ovens, refrigerated bases or storage. 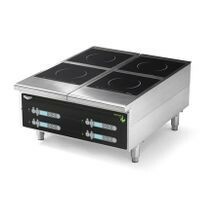 A typical range has six to 10 burners, but four to 12 burner models are available. Ranges vary in size from 12” to 72” footprints. Typically manufactured of stainless steel with cast iron or welded steel grates, ranges are a valuable, durable asset to a commercial kitchen. Specialty ranges such as the growingly popular induction, taco, stockpot, plancha, and wok are also great options when customizing your commercial kitchens.